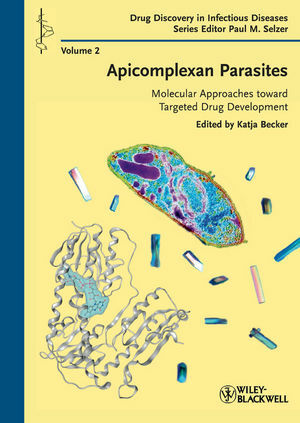 This handbook is the first dealing with the discovery of drugs directed against apicomplexan parasites. Amongst others, this group of endoparasites includes the causative agents of Malaria, Toxoplasmosis, and Babesiosis, the latter occurring mainly in animals. Written by renowned scientific experts from academia and industry, the book focuses on currentdrug development approaches for all apicomplexan diseases making it appealing to a large audience, ranging from research labs in academia to the human and veterinarian pharmaceutical industry. This work is the second volume of the new book series 'Drug Discovery in Infectious Diseases', edited by Prof. Dr Paul M. Selzer. Prof. Dr. Katja Becker obtained her Academic Degree in Medicine at Heidelberg University. She carried out her doctoral-thesis as well as her Habilitation at the Biochemistry Centre, Heidelberg, before she obtained a Junior Group Leader Position at the Research Center for Infectious Diseases, Würzburg University. Since 2000 she holds the Chair of Nutritional Biochemistry at the Justus-Liebig University Giessen. Scientifically she focuses on the characterization of redox active proteins as drug targets. She has produced more than 170 scientific publications and received numerous scientific awards including the Carus Medal of the German Academy of Sciences Leopoldina and the Leuckart Medal of the German Society for Parasitology. Since June 2009 she is a member of the Leopoldina. Prof. Dr. Paul M. Selzer studied Biology, Parasitology, and Biochemistry at the University of Tübingen, Germany, where he also received his PhD in Biochemistry. He spent three years in the parasitology and tropical disease laboratory of Prof. James H. McKerrow at the University of California, San Francisco (UCSF). During his professional career he worked as researcher and scientific manager for several pharmaceutical companies, being currently employed by Intervet Innovation GmbH, Germany, part of a leading Animal Health company. Dr. Selzer is also a visiting Professor and teacher in Biochemistry, Bioinformatics, and Chemoinformatics at the University of Tübingen, and holds an Honorary Professorship in the Department of Infection and Immunity at the University of Glasgow, UK. Orlistat: A Repositioning Opportunity as a Growth Inhibitor of Apicomplexan Parasites?